The Seattle Seahawks stomp to a resounding victory against the Oakland Raiders in the first NFL London game of the year. Following on from their convincing performance against the Rams last week, the Seahawks continued to surge forward with the aggressive momentum they have recently found. The Seahawks have consistently struggled with their opening drives but bucked that trend today with an impressive first drive consisting of 14 plays for 82 yards that resulted in their first touchdown, courtesy of Jaron Brown. The vast majority of this drive consisted of Pete Carroll’s mission statement for 2018: a commitment to run the ball more. Rashaad Penny had been described by coach Pete Carroll as “frustrated” by his lack of involvement in the game against the Rams last week. He seemed to have channelled that frustration positively this week, though, resulting in 9 carries for 43 yards, his best performance of the season so far. David Moore also continued his impressive season run, notching up another touchdown in the second quarter. Russell Wilson managed to turn a dropped snap into a successful play that gave Moore a 19 yard TD catch, putting the Seahawks ahead 14-0. No doubt falling into the photographers behind the end zone was not part of his touchdown celebration. Whilst the Seahawks were able to set their running game up early, the Raiders were less successful. Their opening drive was over almost as soon as it had started as the Seahawks defense set out to make a statement to what has been a stalling Oakland Raiders offense. They consistently pressured quarterback Derek Carr in the pocket, sacking him a total of six times; 2 1/ 2 of which came courtesy of Frank Clark, who continues his quest for the title of King of the Strip Sacks. Running back Marshawn Lynch should have been the Raiders best hope of getting some substantial yardage, facing the team where he became a legend for his aggressive and powerful running game but he had no such luck in the first half; he was limited to just 14 yards for 8 carries. Following the departure of their star WR Amari Cooper after a hit by Bradley McDougald in the second quarter, Carr struggled to find any offensive weapons that could help Oakland put points on the board. This was further confounded by a missed 48 yard field goal attempt by Matt McCrane, their only real opportunity of the entire first half. Seahawks kicker Sebastian Janikowski made sure he hit his subsequent field goal home, to put Seahawks ahead 17-0 at half time against his former team. The second half saw the Seahawks determined to carry on with their successful run game, primarily letting favoured running back Chris Carson take centre stage again. He had two impressive runs that were negated on back to back penalties, an area that continues to hamper their progress at times. Calls on center Justin Britt and tackle Duane Brown costing the Seahawks on that particular drive. Janikowski sent his second field goal of the evening soaring through the goal posts from the 26 yard line to bring the Seahawks lead to 20-0 in the third quarter. The Raiders were in serious danger at the start of the fourth quarter of having a shutout game and in desperation to get any points on the board. McCrane’s second field goal of the evening proved to be more successful with a 43 yard attempt finally giving the Raiders 3 points. They found themselves with an uphill and unrealistic battle to find any way to get back into this game. By this stage the Seahawks had assumed full dominance over the game and continued to heap on the misery for the Raiders with another touchdown. This time it was wide receiver Tyler Lockett getting in on the action with a ten yard pass from Wilson. 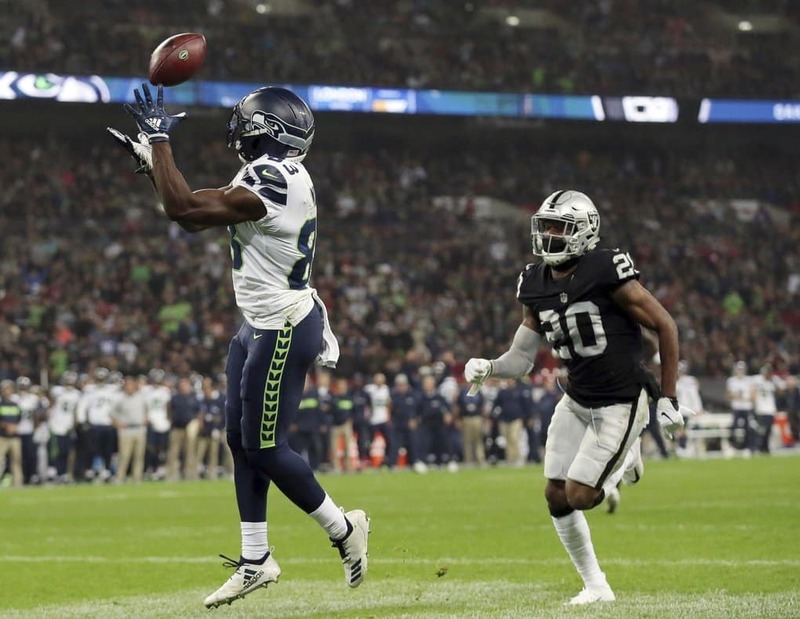 The Seahawks finished a successful first London outing with a resounding 27-3 victory, leaving the Raiders to scratch their heads at exactly what their way forward should be following another loss. Eloquent words about a great Seahawks victory.